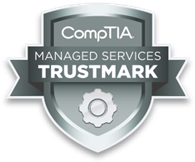 Glen Rock, New Jersey 03/17/15 'Integrated Computer Services, Inc. announced today it has received the CompTIA Managed Services Trustmark ', a respected industry credential that signifies its adherence to best practices for technology service delivery and customer interaction. "Earning this credential identifies Integrated Computer Services, Inc. as a business that meets or exceeds the best business practices the IT industry has to offer," said Nancy Hammervik, senior vice president, industry relations, CompTIA. "This includes managed services agreements, standard operating procedures, systems and tools for delivering services and general business operations." The Trustmark was developed by CompTIA, the non-profit association for the information technology industry, in collaboration with industry experts and leaders, to identify businesses that have made a commitment to the highest levels of integrity and sustained quality service. "We are excited to have CompTIA recognize our team in supporting small and medium sized businesses in an ethical manner." said Michal Cardella, CEO of Integrated Computer Services. "The CompTIA Managed Services Trustmark shows that we have proven to use the best business practices and operate with the appropriate policies and procedures in place to deliver world class IT services with the highest level of integrity"
To earn the CompTIA Managed Services Trustmark, Integrated Computer Services, Inc. was evaluated on several aspects of their business operations, including organizational structure, technology tools and systems they utilize, standard operating procedures and IT service specific activities. The company also committed to abiding by a code of conduct and provided customer references. CompTIA is the voice of the world's information technology (IT) industry. Its members are the companies at the forefront of innovation; and the professionals responsible for maximizing the benefits organizations receive from their investments in technology. CompTIA is dedicated to advancing industry growth through its educational programs, market research, networking events, professional certifications, and public policy advocacy.